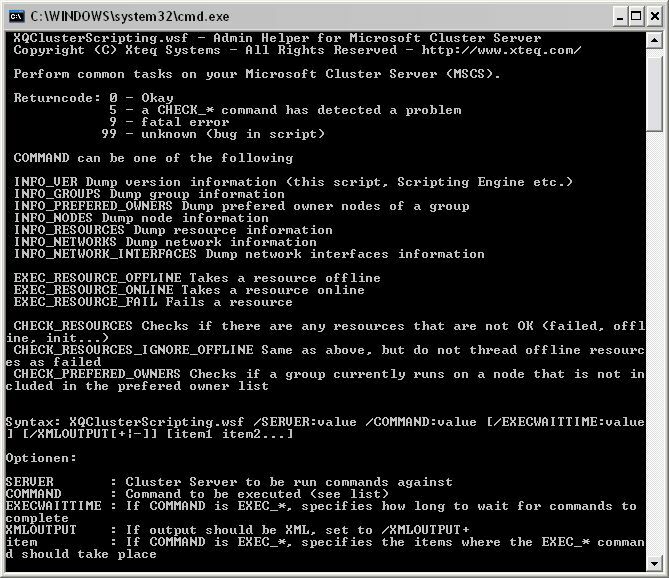 Xteq ClusterScripting is a small 32kb script file that allows you to perform several command on your Microsoft Cluster Server. Basically, it's an command-line interface that allows you to easily administrate your cluster server, check it or generate reports. Xteq ClusterScripting can dump different information about your cluster (Resources, Owners, Networks...), perform several checks (Resource state, Preferred Owner okay etc.) and also take resources offline, online or fail them. It also returns an error code for each action you can easily check by using a batch file command like [IF NOT "%ERRORLEVEL%"=="0" goto somewhere]. For example, if you use the command CHECK_RESOURCES and one of the resources in your cluster is currently offline, Xteq ClusterScripting will return 5. If this happens, you can easily take any action (write email, inform administrator etc.) from within the batch file. 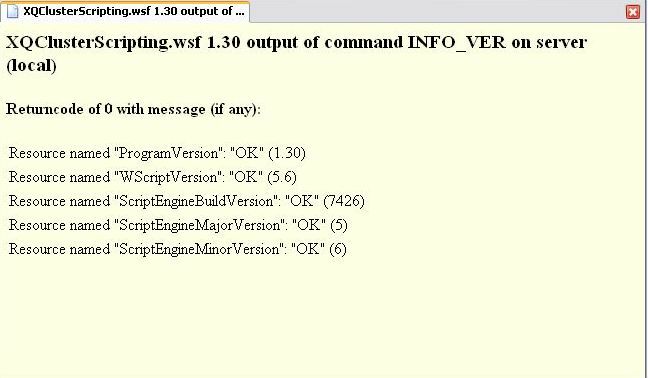 Plus, Xteq ClusterScripting can output the result as XML (parameter /XMLOUTPUT+) so you can directly use this XML output as input for other programs. Or, you may use an XSLT to transform this XML to HTML and display the result in the browser of your choice. An example for this is included inside the file "View XML Output in Browser.bat". To get you started quickly examples for all command Xteq ClusterScripting supports are included.